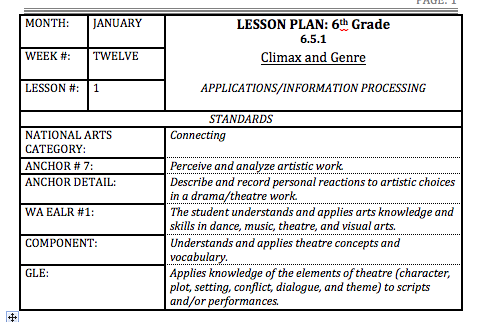 This sample lesson plan for Sixth Grade Theatre Arts, for identifying the genre and climax of a one-act play demonstrates many essential components of classroom management. This lesson is clearly rooted in learning standards. Wong and Wong (2009), find that teachers should aim for accomplishment through the use of objectives and learning criteria. Utilizing a learning target, students are able to assess their learning throughout the lesson; this essential component adds to student voice and student engagement in the lesson content. Student engagement is an integral aspect of classroom management. Effective classrooms have students that are actively engaged in the work (Wong and Wong, 2009). 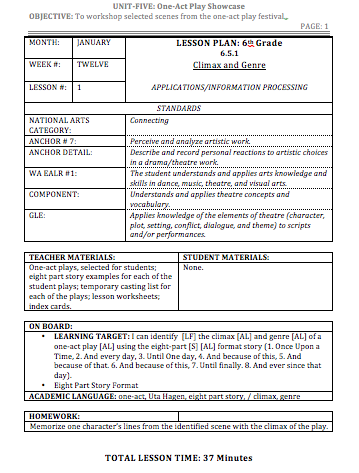 Representing that preparation is at least half of effective teaching, this lesson plan includes the materials the teacher and students will require for the lesson. Utilizing a “hook” to capture student engagement this review segment encourages students to interact with each other and relate their understanding to the learning target. Medina (2008), reveals that, as is the case in this lesson, that the “hook” must be relevant to the learning that is taking place. 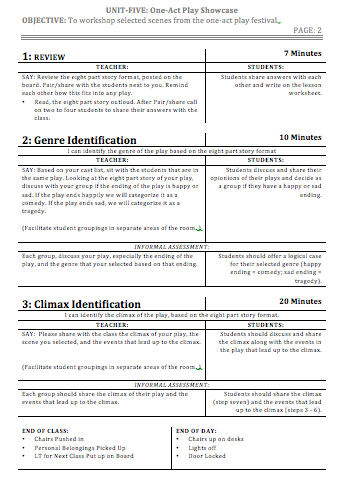 The second segment of this lesson utilizes a short time period, to maintain student attention, and is attached to the learning target so that students can continue to interact with course content and self assessment. The lesson also indicates that the teacher should “facilitate student groupings in separate areas of the room” so that each student can work with limited distractions from other students. Because the groupings are facilitated by the teacher, the groupings can be created with student personality and learning abilities in mind. This segment also includes an informal assessment that will allow the teacher to adjust, mid-lesson, based on learning outcomes. An effective teacher assesses for student learning to enhance the student learning (Wong and Wong, 2009). The third segment of the lesson, allows students to continue to work with the learning target. The student groupings are still in place and the teacher can adjust as needed. As in the second segment, this segment ends with an informal assessment. Through a clear use of repetition in the lesson, students have the opportunity to practice the procedures that govern what they do and how the class functions (Wong and Wong, 2009). Managing the actual classroom space, the lesson plan includes end of day or end of class directions. Medina, J. (2008). Brain rules: 12 principles for surviving and thriving at work, home, and school. Seattle, WA: Pear Press. Wong, H. & Wong, R. (2009). The First Days of School; How to be an Effective Teacher. Mountain View, CA: Harry K. Wong Publications, Inc.